“When I moved to Australia last July, finding a good facial moisturiser with a high sun protection factor (SPF) was high on my to-do list. I’ve been consciously trying to wear SPF containing moisturisers for a few years now, but the high UV index of Queensland makes it a daily essential to stop my pale skin from burning. There are many SPF containing products on the shelves to choose from, but the challenge is finding one that is neither greasy nor sticky and that can be worn under make up. My first forays with the promisingly named Ultra Sheer Dry Touch Sunblock from Neutrogena resulted in shiny skin and an outbreak of spots, while the Ultrasun Face High SPF 30 left my skin feeling taut and a little tacky. I also later realised that it doesn’t filter UVB rays. Much better was UV Perfect by L’Oreal Paris which I picked up on a whim in a supermarket bargain basket. Do you wear SPF daily? What's working for you? Most of my makeup has at least SPF 15 in so I guess I wear it without trying!!! This really is the best! I use a light moisturiser from the sanctuary that has SPF15. Actually, I think there's remarkably few moisturisers on the market in Ireland with SPF...plenty of foundation has it but I mostly wear that at night when the sun is not an issue! Accepting that I am a Kiehls bore, I like Kiehl's Ultra Light Daily UV Defense meself. Well done Roisin! And well done Mrs Fluff as always! Have to say I"m a convert to Clinique's BB Cream with SPF 30 in it, although MAC Prep and Prime with SPF 50 is pretty impressive too! 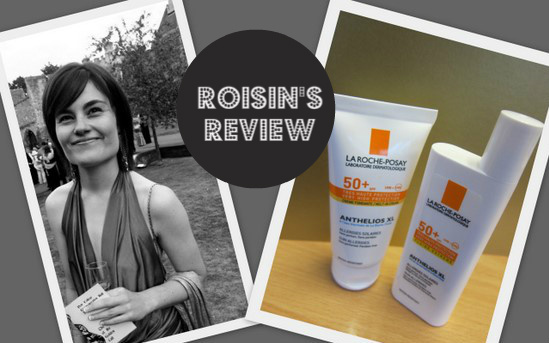 I love le roche posey products, they are so good for sensitive skin!Great review Roisin! your right Emma, she should definitely start a blog! When I'm sun bathing I use P20 all over. Although its not suitable for under makeup, it gives a great even colour without burning (my mum used it on me as a baby so its safe for sensitive skin and really high protection) Its my tanning secret and you don't have to reapply! I really should start wearing SPF everyday since summer is getting closer. I a so with you and already use La Roche Posay moisturized. I've been thinking of switching to something else in their product line so thank you! I never used these products, but seems very good! I need Spf ever in winter, that could be a good solution for me! This is such a great review! Very useful! I recognise this lady !!!! Nicely done :) very nice sunscreen that doesn't leave you greasy or chalky. The best sunscreen is the one that you wear! Sunblock for your face can be so tricky. I'm currently using one that's in my moisturizer. Very light. It's really important because you can easily burn on your face. Great post! thanks for the review! i'm always on the lookout for new products, right now i'm using cetaphil which i really like. I really love this post.. I read it on the train yesterday on my iphone which is why I didnt comment.. This wa sa really useful post. I have issues finding facial sunscreens that don't turn me into an oil slick as I have oily / combination skin. I did try Cliniques Cityblock last year SPF30 and quite liked it though as it was tinted and felt much less greasy than normal. thanks for the tip! I was trying to find products/moisturizer with SPF ! Their official logo is also the figure of the Archaeopteryx. Arcteryx products are usually for outdoor activities like mountain climbing, snowboarding, skiing, hiking and backpacking. When trying to take advantage of this possibility for yourself, it is important that you discover all the essential tools arcteryx jacket you need in order to be prepared for your outdoor http://arcshopstyle.com/ adventure. Longchamp handbags for Popular Ladies, Longchamp Bag for Sale look beautiful, very generous decent, andPossessing branded Handbags peculiarly the planet renowned longchamp Handbags portray your fantastic taste. Chinese lanterns are a special type of lantern, which belong to the traditional culture of the country, China. The uses of these lanterns can be traced back in the history. At present these lanterns are being called in several other names such as sky lanterns and chinese paper lanterns. Affordable fashion jewelry is all the rage in current times. Gone are the days when women considered true gems and precious metals as sterling silver necklaces and wore them on occasions; nowadays, with the advent of faux jewelry available in a variety of combination of precious and semi precious metals and stones, women have innumerable options for accessorizing their costumes. In the coldest of winter months, everyone needs to keep warm and dress properly, especially little kids. Their small bodies often seem so fragile and more vulnerable than adults. Dressing for the winter is all about layers and the warmest of womens fashion dresses. It's important to keep in mind that unless your kids are playing out in the snow, they'll be spending most of their time indoors so do not feel the need to throw on a flannel shirt and a thick sweater and hoodie on your children. It is actually your wedding day! A dream coming true and naturally you intend to look your best more than any other day of your life. All the details are already arranged to avoid any kind of errors on the big day. The wedding shoes for bride was likewise created as per your choice and now you have been shown many different wedding tiaras to pick from. Although each look stunning, it should be remember that it should accentuate the entire beauty of the bride. Over the knee boots are considered as hot fashion items as they are popular not only with the "average" woman but also with the celebrities. However, it is important that you go for an outfit that will match perfectly so as to achieve that hot look. Stockings, leggings and skin tight jeans are perfect outfits to wear with knee high boots. There are many different styles of Buddhist jewelry to choose from. However, what is the right style for you? While most jewelry is a personal preference, Buddhist jewelry isn't just a fashion statement. Instead they should be used to help heal your body and mind. Allowing you to gain either enlightenment or health through wearing Buddhist Jewelry. ,she will like it very much .And she will love you deeply . Tissot is undoubtedly one of the most prominent Swiss brands of watches. This brand always goes that extra mile to provide extra sophistication, style, luxury, technology, performance and durability to give you that overwhelming feeling of happiness every time you wear a mens tissot watch.